Pulse the butter with the dry ingredients in the food processor. Pulse about 15 times just until the butter is incorporated and the mixture has coarse crumbs. Continue to pulse while you slowly pour in the buttermilk mixture, just until the dough comes together. Fold in the white chocolate chips and the nuts. Turn the dough out onto a floured board and pat into an 8 or 9 inch disk. Cut in half, then into eighths. 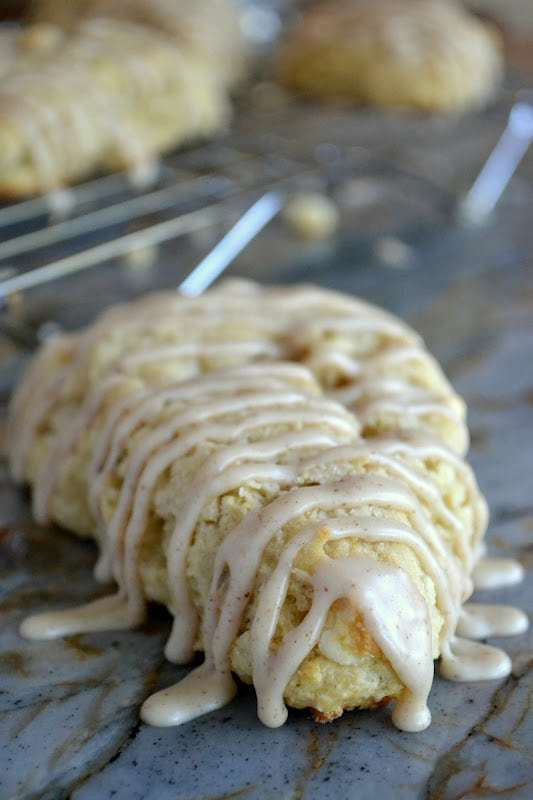 Place the scones onto a silpat or parchment covered baking sheet. I usually put this into the freezer for about 15 minutes while I clean up, this gives the butter a change to chill and helps the scones rise up light ad fluffy when they hit the hot oven. Bake for about 15 minutes. Don't over bake. Cool on the pan for a couple of minutes, then on a rack. Glaze the scones when cool to the touch. To make the glaze: In a small sauté pan, heat the butter and continue heating gently until the milk solids turn brown, stirring occasionally. Keep an eye on it, you don't want it to burn, but you want to get a nice deep brown color. Take the pan off the heat and add the butter to the sugar. Add just enough milk to thin the glaze to a drizzling consistency. Drizzle on the cooled scones.